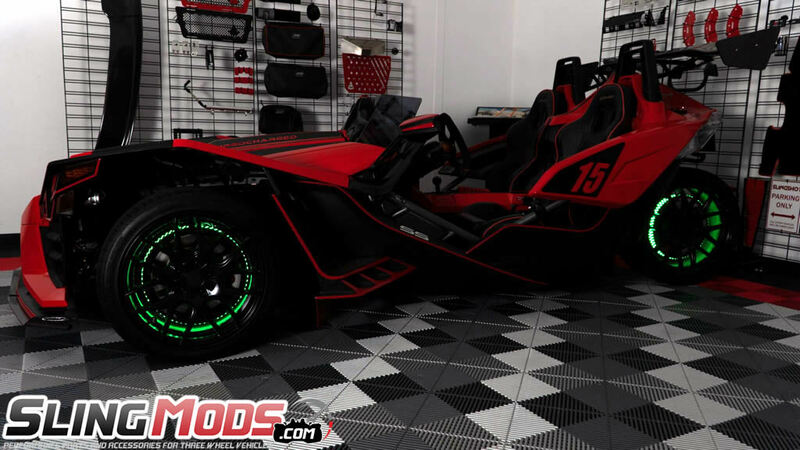 After 2 years of development we are very excited to introduce the Chaser LED Wheel Light Kit for the Polaris Slingshot by TricLED. 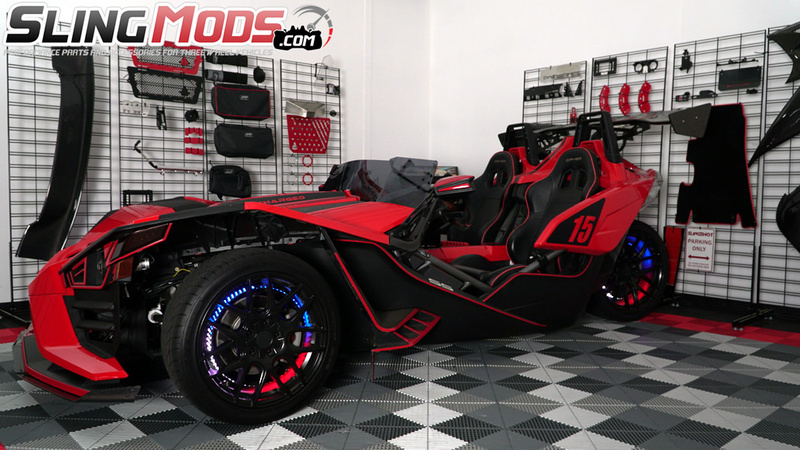 Unlike other wheel light kits on the market, these rings are made of steel and powder coated black for longevity and designed specifically for the Slingshot application. 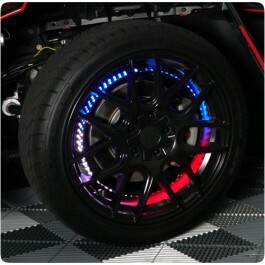 Each wheel light kit includes (3) steel wheel rings with black powder coating, (9) smoked tube chaser LED Strips for a brilliant display of light (3 per wheel), a chaser module box that lets you expand your wheel lights to add on both chaser halos and the chaser underglow kit, 1 RF Remote control, all necessary plug and play wiring extensions and both brake light and turn signal integration modules. 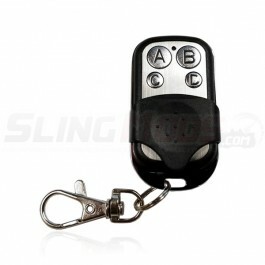 You'll have the ability to cycle through dozens of light variations and control both speed and sequence all from the included RF remote control. 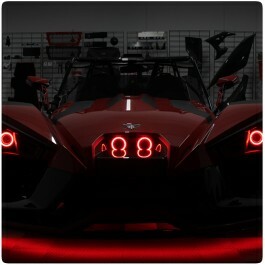 When you touch the brake pedal the rear wheel will illuminate red even if the wheel light show is not in use. 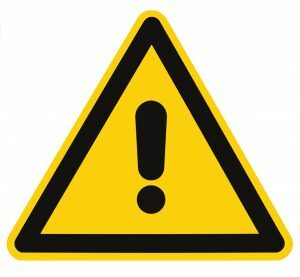 When using your turn signal... the corresponding wheel light strips with illuminate amber letting other motorists know your intentions. If you use either the brake light or turn signal features when the wheel lights are in a chasing light sequence, the light show will temporarily interrupt that wheels light show for either the turn signal or brake light functionality. After testing several wheel light kits on the market.. this is the only kit we've launched on our site. It's extremely thought out, well built and looks absolutely stunning when in use. Another thing that sets this kit apart from the pack is that both the turn signal and brake light features are always operable, even when the light show is not in use. 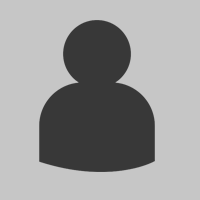 We feel this drastically increases safety on the road by increasing the visibility to other motorists. Really good purchase.....easy and simple installation. Works just as advertised and well worth the money spent. I wanted to be more visible at night to people in cars and this really took care of that. These are not cheap but I think worth it for safety if nothing else. 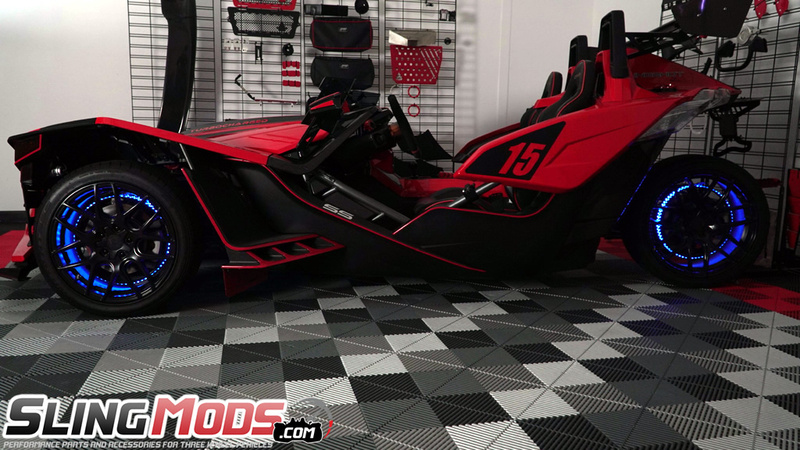 Add a light show to the front of your Polaris Slingshot with the Magic Tric LED Chaser Halo Rings wi.. 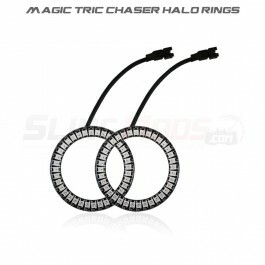 Expand your chasing LED halo ring set with this set of add on rings for the Polaris Slingshot.. 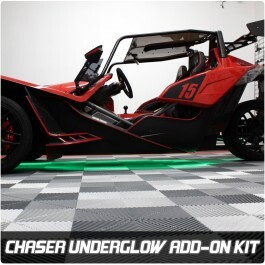 Expand your Chaser LED Light Show to the underbelly of your Polaris Slingshot with this 5-Piece Unde..
Add a 2nd Remote Control to your Chaser LED Light Kit with this Programmable RF Remote from TricLED..